If I am asked to name one of the most adored and common dessert in Bangladesh loved by all ,the answer would definitely be “Pudding” ! 🙂 Though not popular in rural area but no middle class family can think of a special party without this creamy , mouth watering dessert!!!!!!!! 1. In a mold evenly spread sugar and water. Swirl around to make sure it is evenly coated . Heat the mold on medium low flame until it takes beautiful red color . If you see the caramel gets darker than other sides add some water and swirl around the mold to coat it evenly. When caramel is done, let it cool . 2. Beat the eggs with a light hand using a fork . Don’t use blender!!!!!! If you over whip the egg , your pudding may not have that smooth . creamy texture . The less you whip , the smoother your pudding is!!!!!!! 3. If you love the cinnamon , cardamom flavor then put 2 pods of cardamom and one 1″ stick of cinnamon to the milk and microwave it for 1 minute . Cover it until it gets cool. Now take out the cinnamon , cardamom from the milk . Now blend the milk , sugar and breadcrumbs and mix them with the egg mixture . I’m saying again DON”T BLEND EGGS!!!!!! if you don’t like cinnamon , cardamom then add few drops of vanilla flavor. 4. Strain the mixture through a strainer to get smooth , velvety texture . Pour them into the mold and cover it with a tight lid . 5. Now you can steam or bake the pudding . If you bake it , take a tray , filled with water and place ur mold on it and bake in a preheated oven at 325-350FH for 30-40 minutes . After 30 minutes check your pudding with a knife , insert the knife , if comes out clean , your pudding is ready . But if you decide to steam, pour water in a wide bottomed vessel and place the mold on it . Cover the lid very tight so that water should not enter into it. One-third of the mold should be submerged in the water, not more than that . You may add water , if the water dries out soon . Steam this way for not more than 30 minutes . Insert a knife and if it comes out clean , your pudding is ready . Overcooking can ruin your cream caramel . 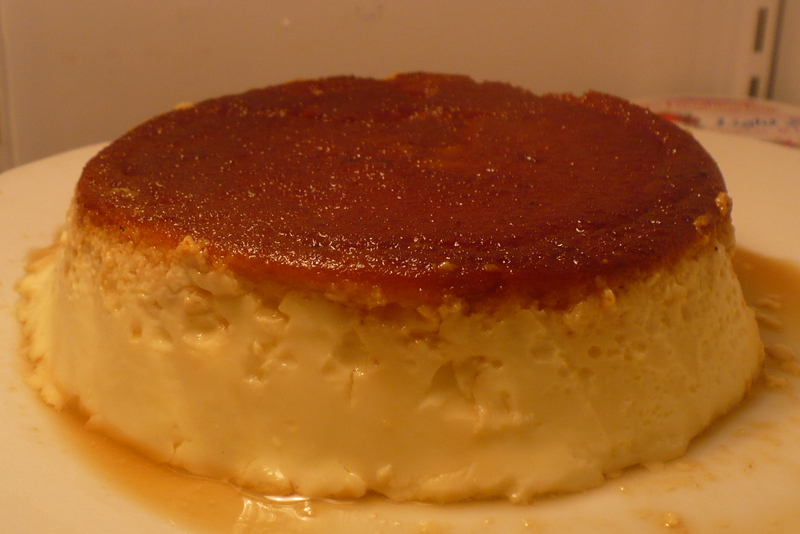 The pudding is done , when toothpick inserted is clean but the center still jiggles a bit . 6. Let it cool , take the serving dish and place it over the pan and turn it over . Tap for a moment to make sure it’s on the dish . 😀 Serve chilled . 3. Sometimes we see , our pudding fall apart while turning it over . One trick may help. If you use bread crumbs , it prevents the pudding to fall apart. 4. The smaller your mold is , the more volume it would add to the pudding . 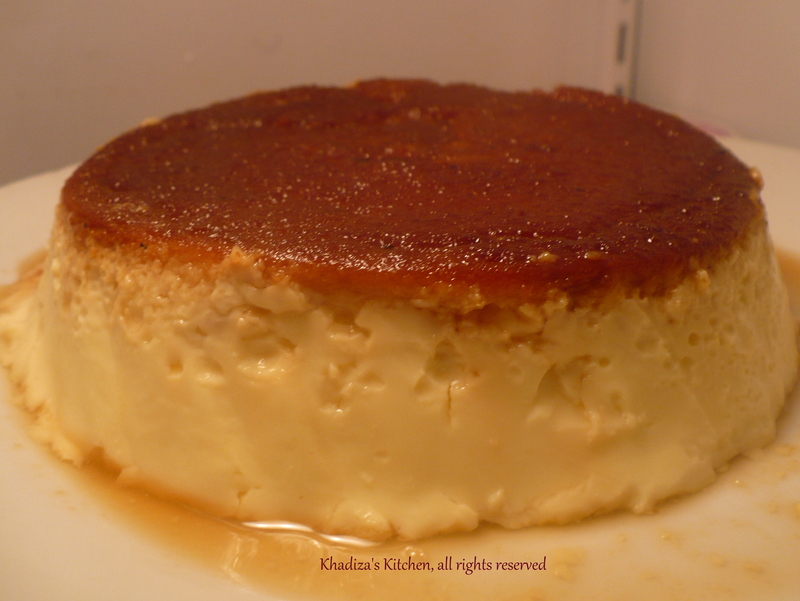 This entry was posted in Desserts, Glossary / Notes and tagged cream caramel recipe, flan recipe, Pudding recipe. Bookmark the permalink. পুডিং আমার ছেলের খুবই প্রিয়। সে এলে রোজ একটি পুডিং তার চাই ই চাই! API Kun dhoroner mold use korbo..cake korar j mold gula powa jay oi gula te to lid nai..apu chular j oven tA t thake oita te ki aluminum er jinish use kora jay? ?